With the warm weather and sweet smell of green grass in the air, one of my favorite “rites of spring” is to take a walk on the well-known Farmington Canal Trail. The path is long and straight with very little in the way of hills, making it ideal for the long-distance runner or the young ‘un who wishes to cast off his or her training wheels. However, I often wonder how many people actually know why such a walk exists? Where would I find my answer? At the Watkinson, of course! The New Haven and North Hampton Railroad was built alongside the original 78-mile Farmington Canal. In 1836 a Southport man by the name of Joseph Sheffield became the primary stockholder. Realizing canals were far less efficient than railroads, Sheffield hired Professor Alexander Twining of Yale to survey the line from New Haven to Plainville. What Twining found was that the paths created for the animals to tow the barges up and down the canal were an ideal roadbed on which to lay tracks. However, the question remained, what would be the northern terminus of the railroad? In the towns of western Massachusetts, where politicians and businessmen alike realized the construction of a railroad would yield instantaneous prosperity (and perhaps reelection! ), a flurry of lobbying began. Westfield was no exception. On April 9, 1849, the town held a meeting where a resolution was passed stating two points. First, the town publicly acknowledged the suffering of its citizens who made sacrifices (giving up land, etc) to allow for the building of the canal. Unfortunately, the canal never produced the type of economic prosperity promised by the company, leaving Westfield with nothing more than an artificial river. Therefore, restitution needed to be made in the form of a railroad. 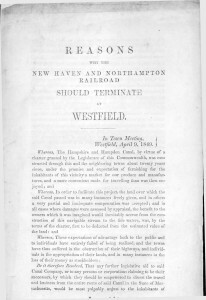 The resolution further states “that while construction of the proposed Railroad to Springfield could add little or nothing to the prosperity or business of that town…the Legislature, whenever it is possible, [should] encourage the establishment and growth of other such centres of activity and business.” In other words, Springfield already received their share; it was time to spread the wealth. The pamphlet goes on to explain that a letter had been received from Mr. Sheffield in which he remarked, “We are pleased to learn that you are awake on the subject of Railroad extension.” The town was then asked to provide the amount of tonnage local industry could provide year-to-year. This was seen as an obvious positive sign that Westfield could indeed become the northern terminus of the railroad. However, as was typical of railroad tycoons (often known as robber barons) of the late 19th century, Sheffield was stacking the deck. The data provided by the town was used as a means to determine which would be most profitable for the company. Towns throughout central Massachusetts, whether they knew it or not, were being pitted against one another as a means of getting the “best deal” for the railroad. 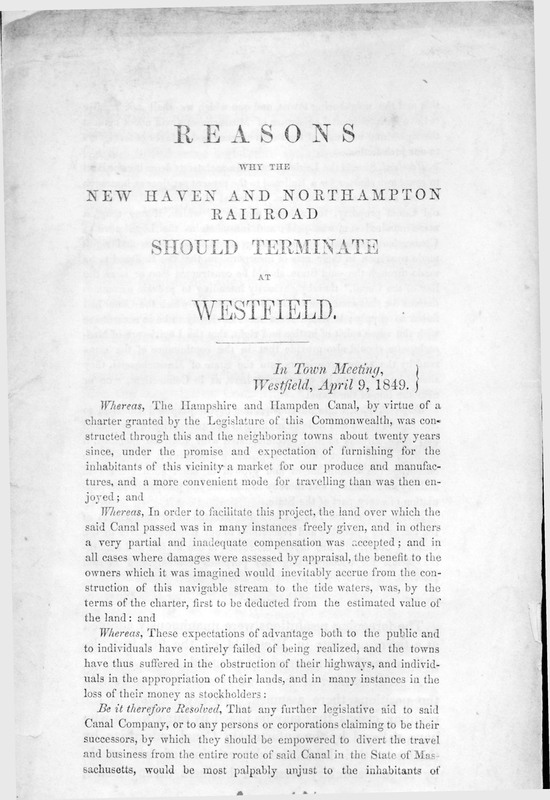 Westfield, perhaps due to this resolution, did in fact get its railroad. However, it would not be the northern terminus. Northampton was chosen instead as it would interchange with the Troy and Greenfield railroad. In 1887, the New York, New Haven and Hartford railroad began leasing the line and would eventually purchase it outright. Like Alice’s journey down the rabbit hole, the descent into the stacks of the Watkinson Library is a journey filled with wonder, confusion and excitement. Where will you end up? How far down is the bottom? And what curious items will be waiting for you when you get there? I found the Dodgson family waiting for me at the bottom of the stairwell hidden between books on shoes and ships and sealing wax and cabbages and kings. What I thought was going to be a simple journey just enjoying a childhood favorite opened the door to a much more exciting find. Lewis Carroll’s classic masterpiece Alice’s Adventures in Wonderland has been a favorite of children and adults for the 148 years since its initial publication. His nonsensical story of the “exactly seven-and-a-half-year-old-girl” who tumbles through a rabbit hole has been translated into thousands of languages around the globe including rare aboriginal dialects, and has never been out of print. One of the most quoted novels of all time, Carroll’s heroine, Alice, finds herself in the world of nonsense where you take advice from a hookah smoking caterpillar, you’re bombarded with riddles at a mad tea party, you play croquet with the queen and you can grow taller or smaller with cookies and mushrooms. 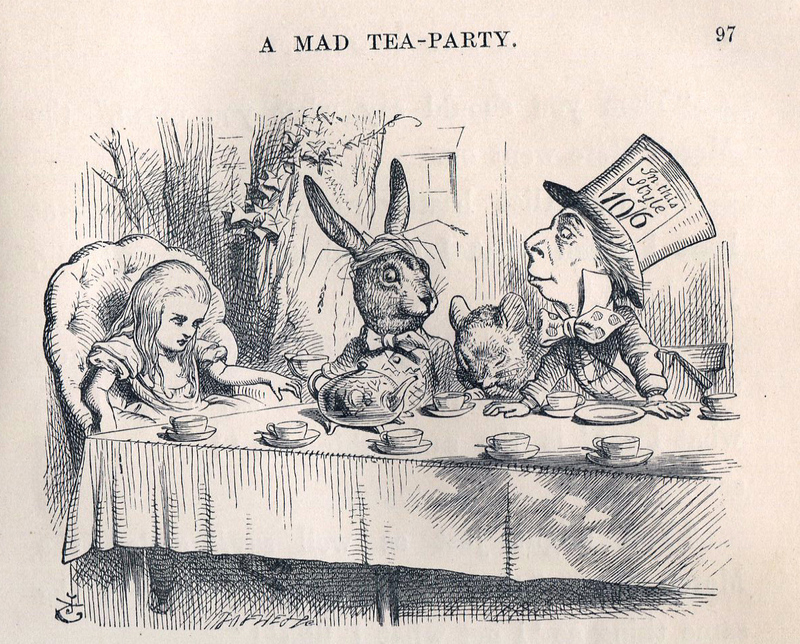 Originally set for publication in 1865, the release of Alice’s Adventures in Wonderland was held because of both Lewis Carroll and John Tenniel’s disapproval of the poor printing quality of Tenniel’s illustrations. 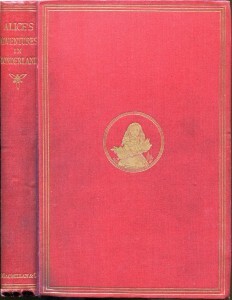 The original run of Alice was supposed to be sold as scrap paper but instead the unbound copies ended up in New York where it was issued by D. Appleton and Company in 1866. 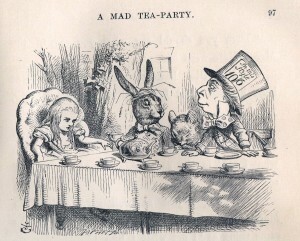 In November of 1865 with “very far superior” illustrations and “in fact a perfect piece of artistic printing,” Alice was published by Macmillian and Co. with an 1866 publication date and she was finally available in England. Charles Lutwidge Dodgson, the man behind the legend, used the pen name Lewis Carroll to author his Alice books and much of his other nonsense, poetry and children’s literature. Dodgson was born 1832 to the Reverend Charles Dodgson in a small village in Cheshire England. In 1843 the Dodgson family moved to Croft, a town in Yorkshire where they remained until 1868 when the elder Dodgson died. Living at the Croft Rectory provided the Dodgson family with more money and a better lifestyle than they had in Cheshire. Among the benefits of this new position was being able to employ servants for the family. The Watkinson has several copies of Alice ranging in publication, but the 1866 edition is truly a special find. 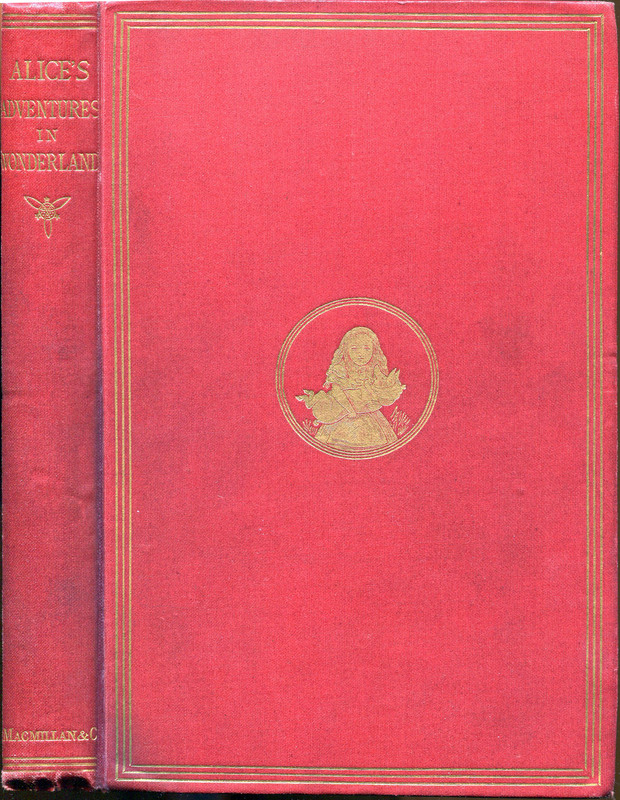 This copy of Alice is listed in the Watkinson’s online catalog with the note “Presentation copy from Lewis Carroll and his family to Emma E. Vine, a nurse in their home, Croft Rectory.” I had to know more. 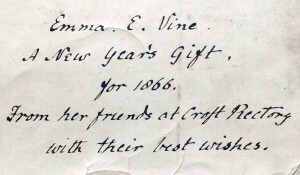 Upon inspection of the book, I found the inscription on the inside, which reads, “Emma E. Vine / A New Year’s Gift / For 1866 / From her friends at Croft Rectory / With their best wishes.” I was getting curiouser and curiouser. So there it was, the connection I was looking for. This book was in fact the presentation copy to the Dodgson family nurse. 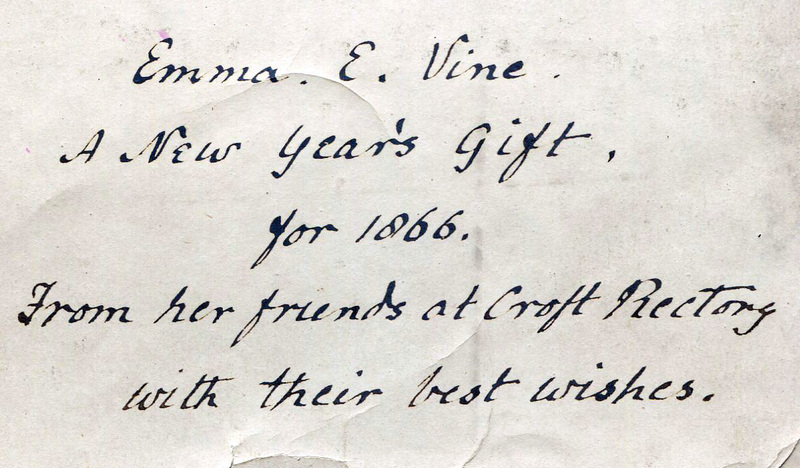 Not only does the Watkinson have the book but it has the priceless notes from Louisa that verifies the gifts provenance and unique history, and clues the world into a bit of the Dodgson family’s history. What started with a childhood favorite turned into uncovering a story from the Dodgson family and their one of a kind gift to their family’s dear servant. What a rare find that exists only in the rabbit hole that is the Watkinson Library. The election of 1800 was pivotal in American history, ultimately resulting in the first democratic peaceful transfer of power between two opposing political groups – the Federalists of John Adams who was the sitting President, and the Republicans of Thomas Jefferson, who was the sitting Vice President. 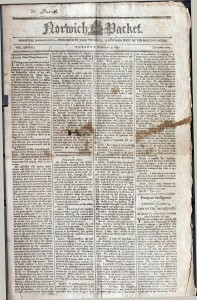 What I searched for and found at the Watkinson were two issues of a 4-page Connecticut newspaper, the Norwich Packet, published on February 24 and March 3, 1801. My purpose in finding those newspapers was to understand what an ordinary American citizen of the time would be reading about the election and its immediate aftermath. 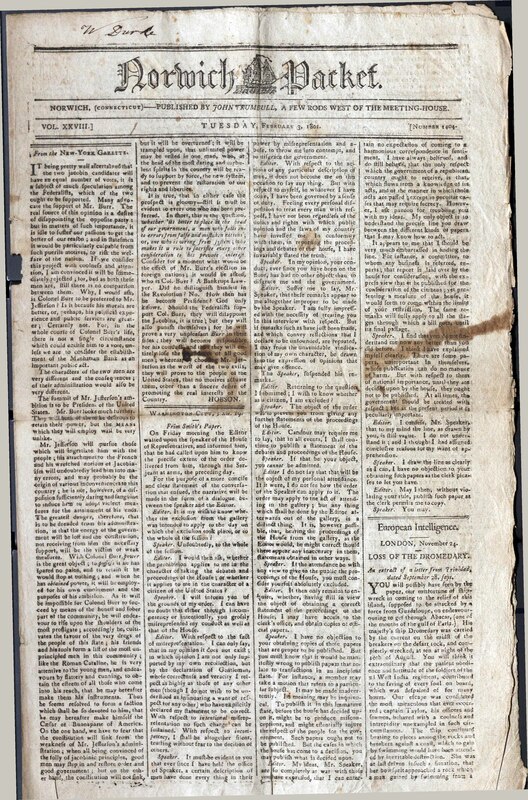 We began our search the old-fashioned way, using a card catalog, and after a bit of hunting, found a cache of original newspapers unbound as readers over 200 years ago would have read them. I wondered if anyone back then could have possibly anticipated that a newspaper they used one day and threw out the next would survive for so long. In a section headed simply, “Election of a President” the results of the election of 1800 (as reprinted from the Philadelphia Gazette of February 14) were officially recounted thus – “According to the rules of the proceeding established by the House, they proceeded to the Senate chamber where….the votes were counted and the result declared by the Vice President [Thomas Jefferson] as follows: Thomas Jefferson 73, Aaron Burr 73, John Adams 65, C.C. Pinckney 64, John Jay 1”. The tie vote between Jefferson and Burr required the House of Representatives to determine the winner through a process prescribed by the constitution, with each state having one vote and it being necessary to have a simple majority of the states to win. In that same issue, the repeated indecisive votes in the House of Representatives were relayed – “Eight states for Jefferson, Six for Burr, 2 divided” along with a description of the actual method of balloting. One of the representatives from Maryland was so ill he was unable to go to the House chamber, “and had a bed prepared for him in one of the committee rooms to which the ballot box was carried to him by one of the tellers appointed on the part of the state”. The deadlock continued for days. In the issue of March 3 it was related that on the 35th ballot taken on Tuesday, February 17, the deadlock was finally broken, resulting in the election of Thomas Jefferson as president with 10 states for him, only 4 New England States for Aaron Burr, and two states with blank ballots. In a small “Public Notice” on the third page of the paper there appeared a notice that “A Day of Thanksgiving is to be kept in Wallingford on the 11th day of March next”…and “at 6 in the evening on the same day an oration will be delivered by Abraham Bishop esq, of New Haven” . “All real friends to our happy constitution and to our illustrious Thomas Jefferson, President-elect, and to Aaron Burr, our patriotic and worthy Vice-President, elect, are invited to attend”. Interestingly, the transcript of Mr. Bishop’s remarks was subsequently published in New Haven that same year, an original copy of which also resides at the Watkinson Library. This is what a citizen of Norwich, Connecticut would have read in 1801, two weeks after the actual event. They would not have known yet how or why the change in vote occurred that ultimately resulted in Jefferson’s election. The political intrigue and bargaining that resulted in the final outcome has taken over 200 to understand and ponder and the debate continues to this day. You are currently browsing the I Found It at the Watkinson! blog archives for April, 2013.